Congenital heart defects (CHD) can be detected at ultrasound but are sometimes not diagnosed until birth, which can cause stress and heightened emotion within the family. Parents face challenges including dealing with surgical procedures for their child and integrating healthcare management into family life. The aim of this review was to understand parental coping with their child’s CHD. Six databases were systematically searched to identify qualitative studies relating to parental coping in the context of having a child with CHD and which met inclusion criteria. Studies were subject to quality appraisal using Walsh and Downe’s checklist, and synthesised using Noblit and Hare’s meta-ethnographic approach. The synthesis of 22 studies reporting on 704 parents’ accounts showed that parent coping fell within four overarching themes: Emotional Responses, Support Systems, Parental Management and Avoidance. These four themes contained 13 subordinate themes. Parental psychosocial coping varies over time from diagnosis, through surgery to childhood. Common themes were evident, but individuals employed their own styles and strategies based on prior experience, availability of social support, personal characteristics and beliefs. Parents tried to maintain a sense of normality, integrating CHD into their lives without it having a major impact except at times of transition and hospitalisation when they had to call on additional strategies or support to manage this stress. This review offers clear guidance to clinical services on how best to support parents and families. Congenital Heart Disease (CHD) is one of the most common types of birth defects, affecting 8 per 1000 babies born globally (Bernier et al. 2010), and prevalence has increased over time (van der Linde et al. 2011). As there are many variations of CHD which sometimes occur in combination and with differing severities, prognosis and treatment may vary between individuals. NICE guidance (National Institute for Health and Care Excellence 2016) advises that “children, young people and their parents or carers may need support, and sometimes expert psychological intervention, to help with distress, coping, and building resilience” (p. 14) and emotional and psychological wellbeing should be discussed with families regularly, particularly at times of transition. Chronic illnesses, such as CHD, and their associated complications can adversely impact family life (Alkan et al. 2017; Tak and McCubbin 2002; Werner et al. 2014; Wray and Maynard 2005). Presence of CHD has been shown to increase the vulnerability of the whole family to psychological and social distress (Doherty and Utens 2016; Mussatto 2006; Soulvie et al. 2012). However, using the perspective of coping, many studies also show that parents and families manage to adjust to the presence and demands of childhood conditions (Bajracharya and Shrestha 2016; Spijkerboer et al. 2007). For example, families can be put under strain of a chronic illness at various time points (Sawyer and Spurrier 1996) including at diagnosis (Ailes et al. 2014), birth (Brosig et al. 2007), surgery (Utens et al. 2000) and adapting to the integration of healthcare alongside typical parenting (Goldberg et al. 1990; Lawoko and Soares 2002). The experiences of parenting a child with a chronic illness, and the impact of paediatric illness on families, have been reviewed (Cousino and Hazen 2013; Shudy et al. 2006). In their review of 94 studies to explore the impact of CHD on families, Wei et al. (2015) identified major themes based on quantitative checklists of parents’ psychological health, family life, parenting challenges and family-focussed interventions. However, most of these studies were quantitative and used self-report measures with pre-defined questions and answers. As such, these studies could not have reported on the detailed influences of CHD on parents and certainly not in the parents’ own words. Furthermore, deductive methods use prior assumptions that may not answer the research question (Al-Busaidi 2008). In contrast to quantitative methods, qualitative methods provide details about human behaviour, emotion and personality characteristics and they enable researchers to make sense of patterns in the meaning through differences and divergence, particularly in health research (Pope and Mays 1995). In another review of 25 studies, featuring mostly quantitative designs but also including some qualitative papers, Jackson et al. (2015) identified that the impacts on a family can include psychological distress and wellbeing, family functioning and quality of life. Coping styles varied dependent on age and gender; mothers sought social support, “vented” about their situation and turned to spirituality or religion, whereas fathers were more likely to use alcohol as a coping mechanism. Coping is a broad term, and so various definitions were considered (Lazarus and Folkman 1987; Snyder 2014) including those specific to psychological adjustment to chronic illness (Felton et al. 1984; Moss and Billings 1982) which had been used in other studies on parental coping (Grootenhuis and Last 1997b; Seideman et al. 1997). These definitions shared similarities relating to the problem-focus or emotion-focus of distress, and the subsequent responses intended to reduce the burden of stressful life events. The Snyder (2014) definition of coping refers to any strategies that effectively manage emotional, physical or psychological burdens, and was considered sufficient and appropriate to cover the breadth of literature exploring parental coping. We set out to answer the following research question: How do expectant parents and parents of children with CHD cope with their experience from diagnosis, surgery and beyond? The meta-ethnographic approach described by Noblit and Hare (1988), was selected to synthesise the findings from the included studies. It is a commonly used idealist technique to synthesise and explore differences between studies (Barnett-Page and Thomas 2009), whilst preserving the rigour and quality of the primary data (Sin 2010). The main themes and concepts identified from systematic searches of the qualitative literature were synthesised to establish broader themes across the studies to be included in this review. The seven-step-approach (Noblit and Hare 1988) was chosen to guide the synthesis process which consists of: 1) Research question, 2) systematic review process, 3) reading and rereading studies and the identification of primary and secondary themes, 4) determine how studies are related to each other, 5) translate the studies into one another, 6) synthesise translations and 7) express the synthesis. A systematic search of six databases was conducted in October 2017 (MEDLINE, CINAHL, PsycINFO, PubMed, ProQuest and Web of Science). Online databases were systematically searched by the first author (MRL). Keywords from four broad areas relating to CHD, coping, family and child were truncated. Multiple synonyms of search terms were utilised using Boolean search operators AND/OR across all databases, with exploded or Medical Subject Heading (MeSH) terms, when available. Broad search terms were selected to cover a wide range of papers based on the SPIDER search tool (Cooke et al. 2012). Hand searching was also undertaken. First, the reference lists of identified papers were scrutinised for additional papers. Secondly, Google Scholar was searched for additional studies using simple broad-based terms to identify any remaining studies (Flemming and Briggs 2007). Studies were included in the review based on the following eligibility criteria: 1) an empirical study collecting qualitative data published in peer reviewed journals, 2) reporting on experiences of parents of infants and children diagnosed with congenital heart disease including how they coped at various stages, 3) included studies utilised samples of parents, over 18 years of age, who had a child who had been diagnosed with a congenital heart defect (CHD). The Snyder (2014) definition of coping was used in our selection of studies so that any paper which made reference to parents managing an emotional, physical or psychological burden was included. No restriction was placed on language or year of publication. Studies deemed as very poor quality were excluded from the review. The search process is illustrated in Fig. 1. The researchers adhered to PRISMA guidelines (Liberati et al. 2009) for systematic reviews and metasyntheses and registered the review on PROSPERO (CRD42017049683) prior to searching (Booth et al. 2012). The first author screened the search results against the identified eligibility criteria. An independent researcher screened 10% of the search results to provide a measure of reliability of the screening process. The agreement between researchers was 100%. The Walsh and Downe (2006) quality appraisal checklist was used to assess 12 different aspects of methodological and interpretive rigour in the included qualitative studies. This checklist contains 12 criteria covering eight stages of research from scope and purpose to relevance and implication of findings. Studies were rated against each of the 12 items and awarded a point if they met criteria fully. The following categories were used: Category A represented studies which were rated as high quality and low methodological bias; these studies scored between 9 and 12. Category B studies were rated as moderate quality; these studies scored between 6 and 8. Category C studies scored below 6 (less than half of the maximum score) and were considered to represent low quality and high methodological bias; therefore, they were excluded from this meta-synthesis (Hannes 2011). The methodological quality of the identified studies was appraised by the first author (MRL). Thirty per cent of papers were reviewed by an independent researcher (K.C.) to verify the accuracy of the quality assessment. 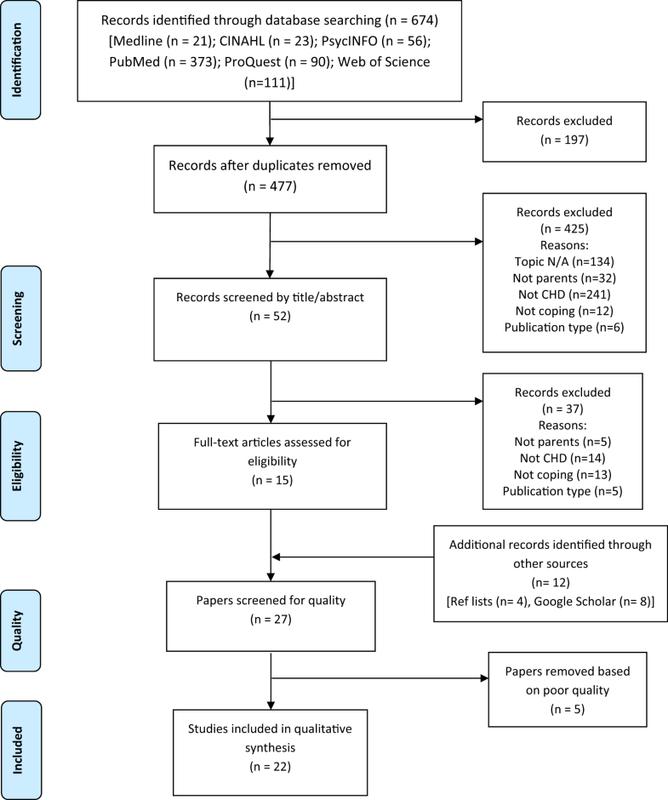 The literature search yielded 22 studies that reported on parental coping with a child diagnosed with a CHD, or a prenatal diagnosis (Table 1). The characteristics for these studies can be seen in Table 2. Studies were from the USA (n = 10), Canada (n = 6), Australia (n = 2), UK (n = 1), Japan (n = 1), Sweden (n = 1) and Taiwan (n = 1). The methods of analysis used in the studies included content analysis (n = 7), grounded theory (n = 5), phenomenological analysis (n = 3), thematic analysis (n = 3) and framework analysis (n = 1). Three studies used secondary analysis and did not detail a specific methodology. Most studies used purposive or convenience samples from health centres and hospitals associated with the researchers. The majority of studies used interviews to collect data, with three reusing data sets through secondary analysis of existing interview transcripts and memos. Two studies used focus groups, while one examined journal entries and one asked open-ended questions as part of a survey. The median sample size was 16, ranging from 8 to 175 participants. Healthcare providers play an imperative role in helping parents understand and adjust to their child’s ongoing medical conditions, the effective ways of doing which are to include them in their child’s treatment and validated their roles as parents by incorporating them in their child’s daily hospital care. 5 factors that influenced Japanese mothers’ coping: the diagnosis event, the number of symptoms of CHD, the anticipated number of surgeries, the presence of chromosomal abnormalities, and the infant’s age. And further, our subjects, Japanese mothers, reported that they held back emotions and evidence of their anxiety. The coping of mothers began when they first received the diagnosis and changed as the surgery date approached. Japanese mothers tried to prepare for surgery without a reliable schedule for surgery and without enough educational preparation. They embraced their high levels of anxiety but dealt with surgery by trusting the health care team. (1) To investigate coping mechanisms of mothers whose infant with complex CHD is admitted in the CICU, and (2) to explore the acceptability and feasibility of mindfulness as a potential stress-reduction intervention for these mothers. mechanisms deal with stress. The active coping strategies include seeking social support, focusing and doing things for their baby, and positively reprising optimistic scenarios. The passive strategies include denial and distraction, which were used by all mothers. Most mothers also use emotion regulation focused coping, rather than problem solving focused coping, as they feel that there are only few things they could do for their baby in the CICU setting. The twofold purpose of this study was to (a) explore and qualitatively describe parents’ caregiving motivation to manage maternal–fetal and infant health care and (b) examine potential links between parents’ motivation to manage health care and their symptoms of distress subsequent to a fetal diagnosis and after-birth treatment of the infant’s CCHD. Based on parents’ descriptions, three categories of the motivation to manage health care were identified and included efforts (a) to determine expectations of health care providers, (b) to reconcile illness- and non-illness-related care, and (c) to express agency as a parent. Although variations in this motivation were found among parents over time, the same three categories were identified in parents’ narratives during pregnancy with a fetal diagnosis and after birth with an infant requiring intervention. The purpose of this exploratory study was to address the following research question: Is the parenting process among parents of children with HLHS characterized by exaggerated vigilant parental action, and if so, how does this influence parental response? The intent was to differentiate the varying intensities of vigilant parental action. Parental response to caring for a child with HLHS was characterized by both vigilant and exaggerated vigilant parental actions. Health professionals taught parents to vigilantly attend to their baby’s complex care requirements, which involved skills such as feeding, weighing, administering medications and oxygen; monitoring all aspects of the baby’s health; and taking action based on subtle changes. There was evidence that vigilant parental actions were exaggerated at times, with parents focusing on the child’s care and monitoring at the expense of other aspects of their life. The purpose of the study reported here was to address this gap in the theoretical and empirical literature by examining how parenting develops after a major fetal anomaly diagnosis. 15 female foetus, 9 male, 2 unknown. Fetal diagnoses included hypoplastic left and right heart syndromes, tetralogy of Fallot, double outlet right ventricle, double inlet left ventricle, coarctation of the aorta. Findings revealed that preparing heart and mind was a dynamic and nonlinear process. Fetal and future child health information, experiences of loss, and social interactions influenced the preparing process. These influencing conditions triggered turning points, described as realizing a different perspective. Expectant parents explained that turning points led them to develop, amend, and anticipate certain strategies for preparing emotionally and cognitively for becoming parents. These strategies included efforts to proceed in service of the child, to address external needs, and to integrate experiences with the normative approach to pregnancy. The purpose of this study was to explore parental experiences of their infant’s hospitalization for cardiac surgery and to identify factors that may be targeted in the future to alleviate sources of parental distress. The research questions were: (1) What did parents find difficult? (2) What would they have liked to be different? and (3) What did they find helpful during their hospital experience? Coarctation of the aorta = 16, hypoplastic left heart syndrome = 14, ventricular septal defect = 11, transposition of the great arteries = 12, tetralogy of fallot/pulmonary atresia with ventricular septal defect = 9, transposition intact ventricular septum = 7, interrupted aortic arch = 5, total anomalous pulmonary venous drainage = 3, tricuspid atresia = 1, other = 5. Parents reported a range of difficulties from dealing with their baby’s unfolding illness, surgery and recovery to the structural and systemic issues associated with the broader context of their experiences. In an effort to be near their baby, parents struggled to obtain the necessities for daily living at the hospital and negotiate transitions between their hospital and home lives throughout the admission. Domains parents identified for change included the availability of facilities and resources and the quantity and quality of information and emotional support. Parents reported relationships with hospital staff as the most common source of support during this challenging time. 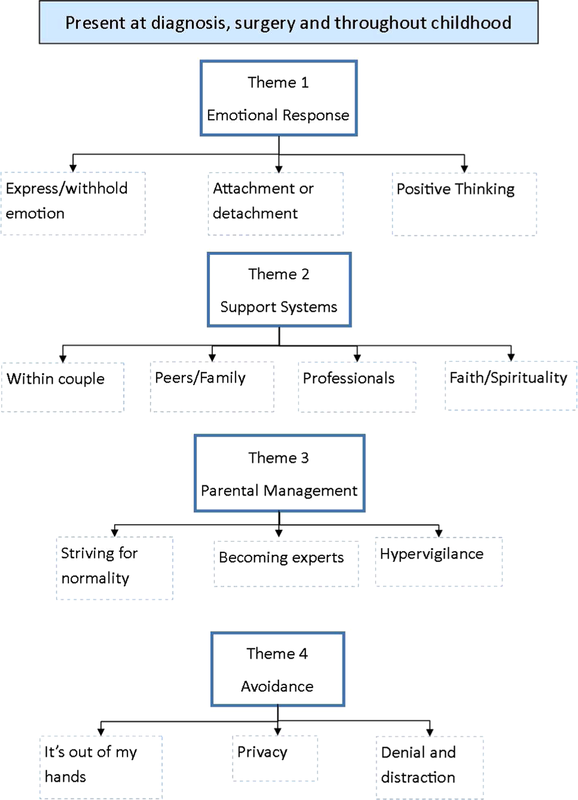 The purpose of this study was to: a) identify existing coping strategies in mothers who have a child diagnosed with CHD based on three coping patterns (I, maintaining family integration and optimism; II, maintaining self-esteem and psychological stability; III, understanding the medical situation); b) evaluate the role of spirituality in maternal coping; and c) investigate Internet-mediated support in maternal coping. Understanding the medical situation and communication with other parents was the most used coping pattern among study participants, while maintaining self-esteem and psychological stability was the least utilized pattern. The purpose of this study was to illuminate the meanings of support as disclosed by mothers of children with congenital heart defects. Anomalous pulmonary venous return, aortic and mitral valve insufficiency, atrial septal defect, atrioventricular septal defect, coarctation of the aorta, discrete subaortic stenosis, double outlet right ventricle, hypoplastic left heart syndrome, single ventricle heart defect, tetralogy of Fallot, and ventricular septal defect. The comprehensive understanding of mothers’ lived experiences of support emerged as the experiences of receiving good support, receiving “poor support,” and absence of support. Our aim was to generate evidence to inform clinical practice with parents of young children with HLHS based on the perspectives of both parents and grandparents using a recent treatment cohort. The research question was: What is the process of parenting young children with HLHS from the time of diagnosis through the survival of the first two surgeries and survival or anticipation of the third surgery? A process of Parenting under Pressure emerged that was characterized by four overlapping and re-emerging phases: (1) realizing and adjusting to the inconceivable; (2) growing increasingly attached; (3) watching for and accommodating the unexpected; and (4) encountering new challenges. The purpose of this qualitative descriptive study was to explore the lived and recalled experiences of mothers of infants with moderate to severe CHD who were diagnosed post-natally and needed heart surgery prior to their first birthday. Cor triatriatrium and partial anomalous pulmonary venous return, 3 transposition of the great arteries, pulmonary atresia and VSD, VSD and congestive heart failure,2 tetralogy of fallot with pulmonary atresia. during the time period of the days before surgery, the day of surgery and days after surgery: 1) Feeling Intense Fluctuating Emotion, 2) Navigating the Medical World, 3) Dealing with the Unknown, 4) Facing the Possibility of My Baby Dying, 5) Finding Meaning and Spiritual Connection, and 6) Mothering Through It All. These themes frequently occurred together and were woven throughout the descriptions of the mother’s experiences. To evaluate the psychosocial status of mothers and fathers of infants with hypoplastic left heart syndrome while in the PICU. All parents reported multiple stresses which commenced with their infant’s diagnosis and endured throughout their infant’s time in PICU. Of 11 parents whose infants were diagnosed with hypoplastic left heart syndrome postbirth, six of seven mothers had acute stress disorder and one mother had posttraumatic stress disorder, and of four fathers, two fathers had acute stress disorder and one father had posttraumatic stress disorder. Parents also experienced losses. Many parents were marginalized from their infant’s care by the environment of PICU. Fifty percent of mothers experienced difficulties with parental-infant bonding. Ten parents (34%) began the process of adaptation to their infant’s hypoplastic left heart syndrome and were assisted by the support and sensitivity of staff or had discovered other resources. The purpose of this study was to conceptualize the needs of parents of young children with hypoplastic left heart syndrome (HLHS) to provide a theoretical framework to inform the development of future parent interventions. Specific research questions included (1) what are the common experiences and needs of parents of young children with HLHS? (2) How can these experiences and needs be synthesized to optimize translation of evidence for health care professionals? and (3) How can the resulting conceptualization inform future interventions? Persistent stress and uncertainty characterized parents’ and grandparents’ accounts. Parents understood the life-threatening nature of HLHS by knowing a child who died or by their own child nearly dying. Parents hoped for the best while simultaneously acknowledging the worst-case scenario. Despite their child’s uncertain future, many parents felt lucky or grateful, especially in comparison to others, and described their personal growth through parenting a child with HLHS. Grandparents’ “birds-eye” view of their adult child’s experiences corroborated parents’ accounts and provided additional insights. Research Question 1: What is the process of family management related to the dimensions of the FMSF in families of infants with HLHS who underwent the early era Norwood procedure in comparison to parents of children who underwent the later era Sano procedure? Research Question 2: How does family management change over time from the initial diagnosis through the early period of home care? The process of family management that emerged in this study began with the diagnosis of the baby’s HLHS, included the baby’s survival of the first surgery, and continued until going home with baby. Each of these time periods was characterized by one family management style more than the others and differences between the early era (Norwood) and late era (Sano) cohorts were evident when particular dimensions of the family management styles were considered. The key finding of this study was that parents demonstrated an intense, dynamic, and transforming process of family management from the diagnosis stage through to the baby surviving the first of three surgeries and going home. The parents whose babies were treated in the era that had improved survival rates had a more positive view of their child’s illness and therefore showed more thriving family characteristics than the parents whose babies were in the early treatment era. The purpose of this theoretically guided qualitative inquiry was to examine parents’ experiences in terms of prebirth caregiving motivations following a prenatal fetal CCHD diagnosis reported retrospectively 1 to 3 months following birth. 14 children. All had multiple diagnoses, including hypoplastic left heart syndrome, tetrology of Fallot, and other serious aortic and valve defects. Semi structured interviews/Directed content analysis. The prenatal diagnosis impacted all aspects of the caregiving system. The motivation to become a caregiver appeared to activate the caregiving system as a whole, to reach the primary goal of protecting, nurturing, and comforting the offspring. Beginning before birth and continuing throughout the first year of life, parents sought to protect, nurture, and comfort their offspring in various ways. However, after receiving a prenatal diagnosis of a CCHD, parents in this sample vividly recalled directing significant energy toward preparing heart and mind, which involved their varied emotions, thoughts, and states of being. Parents used normalization in the context of uncertainty regarding the ongoing survival of their child. Parents described their underweight children as being on their own growth curve, and viewed their developmental progress, however delayed, as reason for celebration, as they had been prepared for their child to die. To describe the parenting experience of mothers and fathers whose child with HLHS underwent treatment that included a series of high-risk surgeries starting with the Norwood surgical procedure soon after birth. The mothers and fathers in this study exemplified extraordinary parenting. Their children with HLHS were survivors of advancing surgical technology and a learning experience for many health care professionals, who therefore were not in a position to provide parents with direction for care. To investigate the essence of the experience of mothers during the decision-making process when facing their less than three-year-old child undergoing heart surgery due to congenital heart disease (CHD). The essence of the maternal experience themes during the decision-making process included (i) understanding the surgery step by step, (ii) role pressure, (iii) constructing care-taking ability, (iv) endeavouring to maintain family functioning while preparing for surgery and (v) deliberate consideration to make the correct decision. To examine the impact of an abnormal fetal echocardiogram (echo) on expectant parents’ experience of pregnancy. We hypothesized that the fetal echo marked a critical point of emotional response, coping and decision making, and that we would observe differences in the way men and women respond to the information and experience provided by this technology. 11 pregnancies at 16–34 weeks gestation at time of fetal ECG. 2 complex single ventricle, congenital heart block and cardiomyopathy, transposition of the great arteries, truncus arteriosis, TAPVR, Epstein’s anomaly, Hypoplastic left heart syndrome. The women expressed strong emotions of guilt, fear and sadness or hopelessness. They coped by attaching and bonding to the fetus, and were realistic about the future. The women began grieving at the time of the fetal echo. The men experienced emotions of anger and anxiety. They coped by remaining optimistic, and focused on supporting their wives. Men grieved after the birth of the baby. The fetal echo was felt to be beneficial and not harmful by the parents. The fetal echo led to significant changes in the couples’ perceptions of themselves and their relationships. Clinicians performing fetal imaging must be aware of parental affective responses and coping mechanisms in order to provide the required psychological support. To obtain the views of their parents about the need for, and shape of, services for rehabilitation. Parents would welcome more help and support from health professionals to enable them to manage more effectively the condition with their children. Particular areas of concern relate to the information they receive about the condition; communication between themselves and health professionals; establishing safe levels of activity; and managing the condition at school. disease (CHD), a potentially life-threatening chronic illness, on the mother–daughter relationship. Normalizing in the face of chronic illness was the overriding theme of the study. Two subthemes related to normalizing arose from the data. “It’s no big deal” was found to best describe how most mothers and their daughters with heart disease viewed their lives and relationships. One other subtheme, “Sometimes it’s a very big deal,” was described by those mothers and daughters who could not, due to ongoing health problems, normalize their lives. Relationships with family as well as age, severity of illness, and developmental stage, were seen as mediators of normalizing in the lives of the participants. Exploratory study, the broad purpose of which was to examine the impact of CHD on the parent-adolescent dyad during adolescence. There were two distinct patterns of coping within the parent-adolescent dyad: (1) coping that was similar between parent and child, and (2) coping that was dissimilar. Within each of these categories were subcategories that referred to the styles of managing the illness situation. The category of similar coping included the subcategories of (a) mutual protection; (b) being accepting of each other; (c) dealing with the illness by normalizing it; (d) approaching the illness mechanically; and (e) keeping the illness in its place. A parallel problematizing and withdrawing mode of managing the illness was the only subcategory identified under dissimilar coping. The studies represented data from 704 parents (511 mothers, 176 fathers, 17 unreported), aged between 18 and 60 years, of children pre-birth to 19 years old. Ethnicity and socioeconomic status varied within and between studies. Some studies focused only on the experience of pregnancy, while others explored parental coping throughout their child’s life. Details of the final 22 studies are summarised in Table 2. All of the eligible studies were screened against Walsh and Downe’s (2006) criteria. Table 3 provides an overview of scores for each included study. Eight of the studies included in this meta-synthesis were rated as category A and 15 were rated as category B. The rating and categorisation process of 30% of the initial 27 studies was also checked by an independent researcher for reliability. There was 75% agreement in the categorisation of the ratings. Despite differences between the studies’ aims, methodology and analysis, there were similarities in the findings, suggesting a shared sense of reported parent coping with a child with a diagnosis of CHD. Four overarching themes emerged from the synthesis, which contained 13 sub-ordinate themes. Figure 2 illustrates the structure of themes and sub-themes. Most of the studies detailed parents’ emotional responses as part of their coping, at the initial discovery of their child’s diagnosis as well as during the surgeries. This theme comprised of three further subthemes that expanded on the category. This theme describes the expression of emotion in relation to their child, but also considers parents’ use of suppression or denial in order to protect themselves from overwhelming emotions, such as shock, grief, guilt, hopelessness, anxiety, anger, sadness and fear: “To define in words the emotion, questions, uncertainty, emptiness, and broken heart that I carried with me through the situation is impossible”(Harvey et al. 2013). Participants in 11 out of 22 studies talked about experiencing extremes of emotion and expressing these: “When my son was in surgery, I cried uncontrollably. I wanted someone to be with me, give me a little hand-holding, and tell me he’s going to be ok.” (Wei et al. 2017), showing how the expression of emotion functioned to communicate to others the need for support. One parent described the strong anger they felt after hearing the diagnosis which has prevailed throughout their child’s life: “I had a lot of anger at God. I was furious and I still am” (Leuthner et al. 2003). In contrast, and only reported in a few studies, some parents described suppressing their emotions in order to cope with their everyday lives: “I am very emotional but I cannot keep walking around with sad face, be depressed. If I get sick who is going to take care of my kids?” (Golfenshtein et al. 2017). This theme captured how parents bonded with their child both before s/he was born and just after birth, prior to their first surgery. These were precarious periods when parents did not know the extent of their child’s complications, nor whether they would survive through a complex operation at such a young age. Parents who treated the foetus as a child before they were even born felt as though s/he was more real, and they were able to form loving attachments even in the face of possible loss: “It’s your kid [child]. You’re the parent of that kid [in utero] that has the birth defect. And it’s just such a hard thing to just do, day by day and everything. This is why I’m feeling this way, because I am the parent” (McKechnie et al. 2015). “It’s my baby and I love him immensely. I loved him before he was born and I loved him when he was born” (McKechnie and Pridham 2012). Other parents did not form the same attachments and reported feeling detached from their child before they were born because they did not know if they would survive: “We didn’t know if she would make it through the first surgery or anything…. not to say you’re detached but you’re a bit guarded… I loved her and I knew that we wanted to keep her but you don’t connect” (Rempel et al. 2013). During the surgery when there was a real risk of losing their child, parents’ fear of forming attachments made them avoid getting too close: “I guess in the back of my mind, I felt that, if she was going to die, then probably the sooner the better because I just knew with time we’d get more and more attached to her” (Rempel et al. 2012) and some did not want to even think about growing close to their child until they knew it would survive: “take him away, make him better and then I… may be able to bond” (Leuthner et al. 2003). This theme explored how parents coped with the often honest or blunt prognosis of their child’s condition. Cardiologists typically informed them of the odds that were not necessarily in their favour, and parents were given the decision of whether to terminate or proceed with pregnancy, then give their child either palliative care or the process of open heart surgery. Parents coped with these dilemmas by believing their child was on the other side of the odds, hoping that they were not part of the risk statistic and doctors were wrong with their prognosis: “Hope! Yeah, that’s all we had, really. I think that throughout the whole thing, the only hope that we ever had was basically that they [diagnosing physicians] were wrong. You can only be so precise when you’re looking through mom, through baby, into a heart. What we heard from the beginning, though, was, ‘Know we can be wrong.’ This is the one case I do not mind doctors being wrong at all. So that was the basis of hope right there” (McKechnie and Pridham 2012). When faced with the reality of parenting a child with long term complex health needs, parents still held onto their optimism: “That’s when I was like, ‘We can do this. We’re going to do this. We’re going to bring him home. He’s going to do anything he wants in life, and he’s going to outlive us.’ And I’m going to make everything in my body, anything in my will power to make that happen” (McKechnie et al. 2015). Positive thinking varied at different stages of parenting, and the initial shock of the CHD diagnosis led some parents to lose that hope. Despite awareness of children who had gone through the process successfully, some parents struggled to accept the possibility of a negative outcome in case it did not apply to them: “It is hard sometime to stay positive when the specialist is not positive. I had to tell my mom- I cannot hear these success stories anymore because it might not happen for us. So on some days it’s helpful for me, but on others… it’s back and forth” (Golfenshtein et al. 2017). However, once the child had made it through the surgical procedures, parents reported embracing the positivity in the unknown: “So you learn to take one day at a time with her and enjoy all the little quirks that she does” (Rempel et al. 2012). A main form of coping for parents emerged in the theme of support systems; it was present in some form in 19 of the 22 studies. Parents cited various people they called upon at different stages of their journey to seek support, whether this was emotional, practical, reassuring or information providing. While most parents accessed some form of support, they still acknowledged that other people did not truly understand what they were experiencing unless they had gone through a similar experience themselves: “Seek out other parents who have gone through it, and talk with them. Nobody that hasn’t gone through it will understand what you are going through” (Sira et al. 2014). Parents reported turning to someone close to them for emotional and practical support. Most of the participants in the studies were married or cohabiting, so often shared their experience with their partner who was able to appreciate first hand their distress and provide support. Support from the partner was present in seven of the studies: “The one person who could <understand> was my husband. He is my best friend, plus the father of my child” (Harvey et al. 2013). “So, my husband is my greatest spiritual support. Yes…spiritual support. If there weren’t him, I couldn’t have got through it” (Lan et al. 2007). Some parents recognised the importance of a shared attitude towards their child, and that it could be difficult to support each other if this was absent, “If you both agree that you want to keep the baby and you know, if you have the same goals in general, I don’t think it’s that hard on the relationship” (Rempel et al. 2012). For many parents, close family, particularly their child’s grandparents, became an invaluable source of support to help parents cope. This consisted of emotional support: “Me and my father have never been close before, but now he gives me all this support, he told me that he is proud of me. For him to actually say this made me feel really better” (Golfenshtein et al. 2017). But it also consisted of practical support to parents whenever they needed it: “…even just going to the grocery store, or washing my little boy, or not asking me what I need, but just looking around the house to see we need laundry to be done. That’s one thing that my mom is good at- she does what needs to be done without asking a hundred times. I don’t want to tell you, just notice and do it!” (Golfenshtein et al. 2017). Many parents made connections with others in similar situations through support forums, and described how they gradually became friends through a shared understanding: “We joined the Association for Children’s Hearts to look for like-minded people… it’s not so often you run into a family with children with heart defects… but through this association we gained a great deal. It felt like it was, yes, the ability to be able to keep the head clear in some way” (Bruce et al. 2014). “The ‘what ifs’ were the big thing. But once I talked to [friend] and learned and listened to her calmness and her organization of things—how to prepare, how to function at home —just listening to what she had to go through, prepared me. So, just asking all the questions and the “what ifs” just calmed me and helped me deal with it” (Rempel et al. 2009). For some parents, the anonymity and availability of online support groups helped them to cope in a way that suited them: “I do not utilize in-person groups… however, I love my online family!” (Sira et al. 2014). Professionals held the position of expert at the start of parents’ journeys, and so were the first providers of information and advice. Parents reported that the honesty, reassurance and information that professionals provided helped them to understand their child’s condition more, and in turn cope better with what they faced as a family: “Every day we started to cope a bit better because we got enough information from the doctor” (Cantwell-Bartl and Tibballs 2013). “We were very upset initially till we saw the cardiologist. Everyone there was positive about the whole thing. Because of them, we had a great pregnancy” (Wei et al. 2017). However, some parents did not feel that professionals helped them to cope, because they felt unsupported by medical staff: “We didn’t have the time or the knowledge to ask everything we wanted to. We were still kind of blown away and it was just information overload on top of it… We got a hand drawn heart on a napkin with everything that was wrong… it’s like, “Really? You couldn’t have gotten a model of the heart to explain everything to us?” (McKechnie et al. 2016). Some professionals seemed to strike the wrong chord with parents, offering unsolicited sympathy: “I found myself, even within just a few weeks [of the diagnosis], getting mad at people.…A genetic counsellor wanted to give me a big hug and [said], ‘I’m so sorry.’ And I’m already kind of getting defensive and getting mad because I’m like, ‘She’s still a baby, and we’re still happy to have her.’ It made me feel like I’m already a parent of a kid with special needs. And I’m not apologizing for my kids, so don’t pity me, don’t pity my kid” (McKechnie et al. 2015). This sub-ordinate theme featured in almost half of the studies. Parents turned to faith, religion and often prayer to call upon a ‘higher power’ for support, and felt comforted when procedures were successful, attributing this to divine intervention: “What kept me calm in the pre-operating area was praying” (Wei et al. 2017). “I have faith in god and that’s the only way my husband and I can go through this. My family and I spent a lot of time praying and that helped calm us down” (Golfenshtein et al. 2017). Parents managed uncertainty around the birth outcome by turning to faith as well, putting their faith in their doctors: “We’ll just let God, put it in His hands and let the good doctors take care of it. That’s about all we can do” (Rempel et al. 2009). This theme includes strategies and styles that parents adopted and wove into their everyday lives in order to adapt to and minimise the impact of CHD on family life. Nearly all of the studies in this review referred to a sense of gaining or maintaining normality, and not turning the child’s condition into a reason to treat them differently. Parents who held this attitude reported coping with the diagnosis by not acknowledging it in their day-to-day life: “Raise the child as if they are going to live. Do not treat them as if they are going to die…. Do not disable them by using their health as an excuse” (Sira et al. 2014). “Actually we usually forget the fact that he had heart disease and that he needed an operation. We considered him normal” (Lan et al. 2007). This attitude was reinforced by professional advice to new parents: “They never told us, ‘Take this baby home, coddle her, and never let her do anything.’ That was not how her doctor thought this worked. Let her do what she wants to, let her live a life. If it’s two months that she lives, fine; if it’s two years that she lives, fine. Let her live that life and that’s the way we felt, too” (Gantt 2002). When offering advice based on their own experiences, the same ideas were given for others to consider: “Live normally. Let your family continue on as normal as possible, because the rest of the world is not going to give one hoot that this kid’s got this heart defect. So don’t let him use it as an excuse. Think positive; hold the vision of good results, and just, you know, deal with it and weave it into your life and your family as normally as possible” (Gantt 2002). This theme features parents’ reports of preparing themselves and their families for welcoming a child with CHD into their lives, by researching information, preparing their home and getting themselves ready to take on the increased care load of a child with often complex health issues. Parents acknowledged the pressure on them once they left the hospital and had to meet their child’s care needs at home, and how they gradually learned about procedures and checks, becoming experts in their child’s condition: “It was a little scary at first. I checked him numerous times a day. I felt very comfortable’cause I had all the equipment I needed at home and the more he stayed at home, the more we got to know him… Being home is different’cause you don’t have a nurse that you can just run to… I kind of became his nurse while I’m his mom and actually got more comfortable [as each] week went by” (Rempel et al. 2012). Parents described coping with their new responsibility of ensuring the health of their child by increased monitoring and checking for any signs and symptoms that would suggest deterioration in health or delayed development. Some became regimented with the medications so they knew that their child was taking exactly what they needed: “I was a fanatic about the medications, you know, that had to be at – the drops at this time and not a minute after” (Meakins et al. 2015). Hypervigilance was heightened when parents took their children home and they did not have hospital staff to turn to for reassurance: “You just feel like you have a job. I mean your job is very important, even as just a parent of a normal healthy child but it’s not as stressful. You don’t have to worry about did they get their medicine? Are they going to be okay today? Are they going to stop breathing and turn blue?… I’ve got to worry about this NG [nasogastric] tube. Is he going to throw it up today? Is he going to pull it out today?” (Rempel et al. 2012). Even when doctors had reassured parents they did not need to do as many checks, they still continued for their own peace of mind: “So every day, we wrote down his weight and his [oxygen] sats, his saturations [between first and second surgery]. Now [after second surgery], we were not told we had to do it every day, but we did it anyway, just for peace of mind for ourselves” (Meakins et al. 2015). This theme contains coping styles utilised mainly in the early stages of CHD, such as when a diagnosis has been made in pregnancy, when parents are given the decision of proceeding with surgery and/or when their child is actually undergoing the surgical procedures. The theme of avoidance covers strategies of parents accepting that they are not responsible for everything, denial of the diagnosis, and using distraction techniques to reduce the time and intensity of worry. Parents reported a sense of allowing big events, such as life-saving surgery, just to proceed without trying to control it too much, because they felt that they could not influence the outcome themselves. They relinquished this responsibility onto the surgeons and left their child in their hands: “Sure, we had to sign a consent and such, but there really wasn’t a choice. I looked at it like: A) We cannot have the surgery and our son will die or B) We can do the surgery and there’s a chance that he will live” (Harvey et al. 2013). Parents also acknowledged that they were physically unable to do everything for themselves and their families, so eventually handed over some aspects of their roles to others in order to cope: “I am not only a parent, I am apparently also just a human with limitation, and I cannot go around the clock [sic] and at the same time doing my job… as it has been for me, my mother was babysitting, so I could go to sleep or work” (Bruce et al. 2014). Akin to the theme of support through faith, some parents reported believing in handing their child’s fate over to a ‘higher power’ and trusting in God’s plan for them: “I don’t know if I believe in destiny or if I just have a lot of faith, but when there’s nothing else you can do, I had to believe that whatever was supposed to happen, would happen” (Harvey et al. 2013). Whether the outcome for the child was positive or not, parents reported: “For whatever reason (I thank God), on this day < of surgery > I felt like I could take it if our son did not survive. We were doing all that we could to give him a heck of a chance but you can’t fight fate” (Harvey et al. 2013). This theme related to parents managing by not sharing information about the diagnosis; for example, limiting how much they told people who asked about the pregnancy: “So there’s nothing to be ashamed of. And we know that. But we also know that not everybody that talks to me and asks how far along needs to know” (McKechnie et al. 2015). This theme continued when the child was born and underwent surgery. In the early stages, once parents received the diagnosis of their unborn child’s heart condition, several reported trying to ignore or deny that there was a problem. The pregnancy felt normal to them, but appointments reminded them of the diagnosis. During the long stays in the intensive care unit, parents reported that they needed something to distract them in order to reduce or avoid the worrying thoughts about what could happen: “I’ve been playing cards here just to get my mind off. I’ll go down and sit with my son for a while and then when I cannot sit anymore I’ll say to another mom- let’s go and play some cards, I feel stressed” (Golfenshtein et al. 2017). These passive coping mechanisms seemed to help distract parents from the severity of the situation and gave them a chance to recuperate: “As hard as it’s been, there were two times that my husband and I have gone, left and ate dinner somewhere. Not fancy, just not in the cafeteria. We even had a beer one night. It felt really good. The next day I was ready to restart dealing with this” (Golfenshtein et al. 2017). These 22 studies from 7 countries were systematically reviewed and their methodological quality was assessed. By drawing together experiences during pregnancy, through surgeries and parenting later in childhood, this synthesis provides a more comprehensive understanding of the various facets of coping that vary over time, reported qualitatively using parents’ own words. Parents who received a diagnosis during pregnancy had the additional stressor and responsibility of making a decision to proceed with the pregnancy knowing that their child would have a chronic condition. This period of time was exemplified by using emotional coping strategies, such as optimism, attachment (or detachment) to their unborn child, and expressing their grief at the diagnosis. Some parents turned to their partners for support and did not tend to invite others to share in this experience because this would expose the reality of their circumstances. Some parents began gathering information to learn about the condition while others employed avoidance strategies so they only had to deal with the condition once they knew the severity (Lalor et al. 2008). Parents who received a diagnosis at birth bypassed the period of uncertainty during pregnancy, but had to face the reality of having a child with a heart condition requiring surgery when they had been expecting a healthy baby. The period between birth and surgery may have been short, and so parents had to adapt much quicker than those who already had the diagnosis before birth. Unequivocally, parents reported coping with the management of CHD by doing their best to integrate it into their lives without it taking over, and leading normal lives whenever possible. Nevertheless, many parents reported developing hypervigilance to any symptoms suggestive of deterioration in the health of their child – an adaptive and entirely appropriate strategy. Parents became experts in their child’s condition, learning about their healthcare needs and developing an understanding of what symptoms indicated the need for medical attention and what was just normal for their child. Findings from this review concur with a review of 29 studies to determine supportive care needs of parents with children with rare diseases (Pelentsov et al. 2015) in relation to social, informational and emotional needs. Similar findings relating to parental vigilance and information seeking, as well as support from religious beliefs emerged in reviews of other chronic childhood conditions (Coffey 2006; Tong et al. 2008). Mothers of children with other foetal abnormalities use similar coping styles to those reported in the synthesis (Brisch et al. 2003; Lalor et al. 2009), particularly the emergence of hope in the face of unfavourable odds (Bally et al. 2018). The idea of coping with the condition by treating the child as normal, or maintaining a normal family life echoes findings from other reviews of children with chronic illness (Fisher 2001). However, it is evident that alongside striving for normality, parents remain vigilant and watchful for signs of potential ill health, when their child has a chronic condition (Niedel et al. 2013) which can be appropriate and adaptive. The findings are also concordant with those of other studies and reviews (Jackson et al. 2015; Shudy et al. 2006) on this research topic in terms of drawing on social support as a strategy for coping. The theme of support was evident although it ranged from support within the couple to the wider family, to seeking out and accessing support from other parents who were going through similar experiences. This provides parents with a shared social identity and enables them to learn from the experiences of others (Shilling et al. 2013), and use of peer support groups has been found to benefit parents across a range of chronic health conditions (Kerr and McIntosh 2000; Shilling et al. 2015; Tong et al. 2008), both online and in person (Bray et al. 2017). An emergent theme was the use of faith and spirituality to cope with unknown or difficult experiences, which has been shown to support parent coping (Raingruber and Milstein 2007). There is little qualitative evidence in other conditions that supports the use of denial or distraction as a coping style: this is often labelled as dysfunctional or maladaptive on measures (Carver et al. 1989). However, in the unique environment of theatre and paediatric intensive care unit (PICU), there is little else that parents are able to draw on. In terms of limitations, it is important to consider that the samples were usually drawn from single heart centres linked to the researchers; thus, there might be differences within that country itself based on the provision of care, especially in countries where health care is privatised. Most parents were married or living with a partner, so these findings do not account for single parent families who may face additional or different challenges to cope with. Although this review aimed to explore parental coping, mothers outnumbered fathers in the studies by 3:1, a common limitation in paediatric psychology research (Phares et al. 2005). 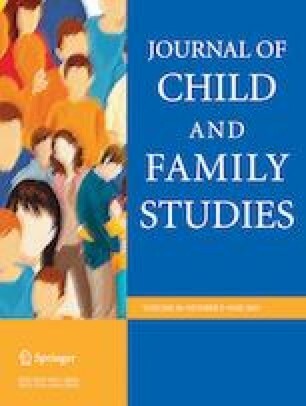 It was apparent from the demographic data that though studies may aim to explore the “parent” experience, the number of mothers drastically outnumbers the number of fathers in inclusive studies.Finally, all of the studies used convenience or purposive sampling which is highly vulnerable to selection bias because it may not be representative of the population (Etikan et al. 2016). The findings of this review have clear clinical implications for services that come into contact with parents of children with CHD. There is a grief and stress reaction at the time of diagnosis (George et al. 2007) when parents must adjust to the presence of the condition (Grootenhuis and Last 1997a); this varies as parents begin to passively or proactively cope with the condition and continues throughout on-going health care, developmental transition stages and any hospitalisations and bouts of severe illness (Melnyk et al. 2001), which health care professionals need to be aware of in their interactions with families. It may be beneficial to make distractions available to parents during the surgical and recovery period, and give them “permission” to take a break, as they may feel obliged to stay in the hospital even though there is nothing they can do. Many parents report drawing on the psychosocial support available to them in the form of wider family and friends. When families exceed their psychosocial resources due to stressful events, whether related to the condition or other life stressors, they may need psychologically minded professionals to notice their need and offer support. It is therefore imperative, when working with children with CHD, to consider the whole family system (Emerson and Bögels 2017) because their wellbeing and vulnerabilities can have a direct impact on the wellbeing of the child (Vonneilich et al. 2016). There is evidence supporting the use of group to specifically support parents of children with CHD (Barnett et al. 2003), which are usually run by a clinical psychologist who could provide additional input for families where appropriate and indicated. These have the benefit of widening parents’ peer support network, hearing stories of survival and strategies for dealing with stress, as well as normalising their and their child’s experiences. In conclusion, parents of children with CHD are more vulnerable to psychological and social distress, and the strain of the condition can impact the family at different points along the journey from diagnosis into childhood. This review demonstrates that while there are common themes of coping in parents, individuals employ their own styles and strategies based on prior experience, availability of social support, personal characteristics and beliefs. Their coping styles draw on their existing resilience and support networks. Once children enter the surgical phases, parents draw on existing individual resources and their support network. Parents try to maintain a sense of normality, integrating CHD into their lives without it having a major impact except at times of transition and hospitalisation when they must call upon additional strategies or supports to manage this stress. The authors would like to thank Gokce Cokamay Yilmaz and Katie Carpenter for screening papers and quality appraising for this review. M.R.L. designed and executed the study, completed the data analyses, and wrote the initial draft of the manuscript. D.M.S. collaborated analysis, writing up of the data and contributed to all drafts. A.W. assisted in the development of the review idea, oversaw the review process, and collaborated in the writing and editing of all drafts of this manuscript. Hannes, K. (2011). Critical appraisal of qualitative research. In Noyes, J., Booth, A., Hannes, K., Harden, A., Harris, J., Lewin, S. & Lockwood, C. (Eds. ), Supplementary guidance for inclusion of qualitative research in cochrane systematic reviews of interventions, Version 1. Cochrane Collaboration Qualitative Methods Group, http://cqrmg.cochrane.org/supplemental-handbook-guidance.